Dipotamata in Andros island, is a river-basin of extreme natural beauty, with a length of about 7 kilometers, in the south-east side of the island, between Syneti, Paleokastro and Kochylou. Water these days is less, but even in drought times it doesn’t stop . Dipotamata in Andros island, is a river-basin of extreme natural beauty, with a length of about 7 kilometers, in the south-east side of the island, between Syneti, Paleokastro and Kochylou. Water these days is less, but even in drought times it doesn’t stop. The natural environment is unspoiled, since the traffic has stopped since the last 35 years. As a consequence the vegetation is very thick (oleanders, mulberry-trees, fig-trees, oak-trees, bushes, reeds, rushes, blackberries, mint, osiers, ivies). The whole area is a shelter for a variety of animals, such as weasels, badgers, hares, snakes and birds (partridges mainly). 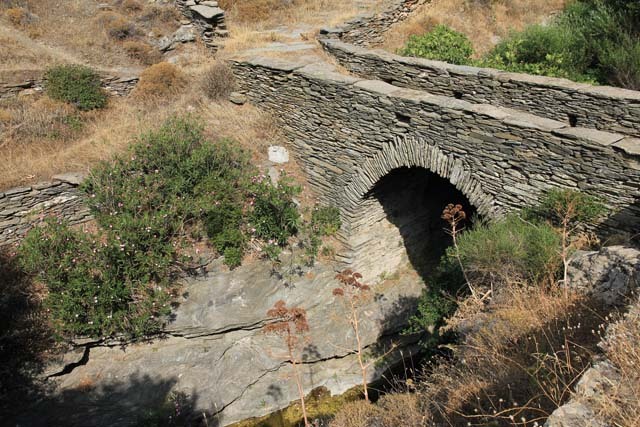 The gorge is crossed by a wide slated cobbled road (the only road connecting Korthi with Chora till 1950). In the intersecting point with the river, there is an arch-shaped bridge and occasionally small fountains. There are also other narrow step-like paths connecting the other villages of the area with the fields and the water mills. In good condition there are also (apart from the paths, the stone-walls, the water-mills and their auxiliary constructions) sheep-cotes, stables, lodgings, barns, threshing floors and country churches. But the most important structures of the area are the water-mills. The reason that in Dipotamata was built a large number of water-mills, was the particularly favourable conditions for establishing and operating them: plenty of running water, good access through the paths, protected environment, small distance from villages, etc. Today can be seen (in good condition, in ruins or in traces) 22 water-mills in all the gorge. Most of them are in very good shape. In a few of them there are neighbouring or adjacent auxiliary buildings, such as a room for the miller to spend the night, sheep-cote, stable or store room. Hydraulic works of big importance and extent for the time and its technological level were supplying and often netting the water-mills. In narrow places of the gorge there were dams, which were forming lakes, to collect water for watering purposes and the functioning of the water-mills. From there, canals were guiding the water in the millpond and eventually into the hole of the machinery of the mill. The remaining water and water coming out of the mill (having rotated its wheel) was guided to the canal of the next water-mill.